It has been said that women do not support each other in the workplace because they are competing for a few positions at the top. In reality, there are inequalities in society everywhere we look, not just the workplace. One glaring example is sports. For example, the Ironman competition-a grueling triathlon that includes 26.2 miles of running, 2.4 miles of swimming and 112 miles of biking-does not provide an equal amount of opportunities for men and women. Women are told to #leanin in business and in life, but leaning in isn’t always enough. We are making it easier for men to have a chance to compete than for women. As a society do we truly believe men and women should have equal opportunities? Not everyone thinks so. And despite the fact that opportunities are not always equal for men and women how can we teach women to be strong competitors nonetheless? 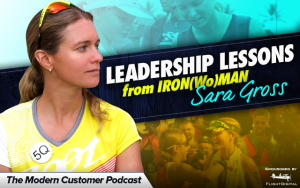 My guest on this week’s Modern Customer podcast is Ironman champion Sara Gross. In this podcast, Sara and I talk about mental toughness and what it takes for women to be successful against all odds.